Team Building is something any business should do. 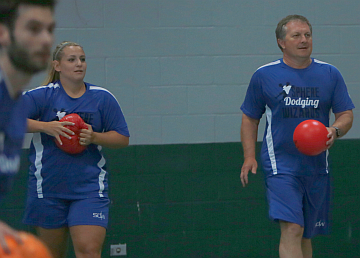 The latest Team Building exercise at SDW is dodge-ball. In the latest community involvement effort by the City of Hattiesburg, the Parks and Recreation Department has created an over 18, co-ed, adult Dodge-ball League. The SDW crew has joined the ranks as the Sphere Dodging Wizards. What a great way to get together, have fun and have a chance to hit your cross town rivals with a ball.